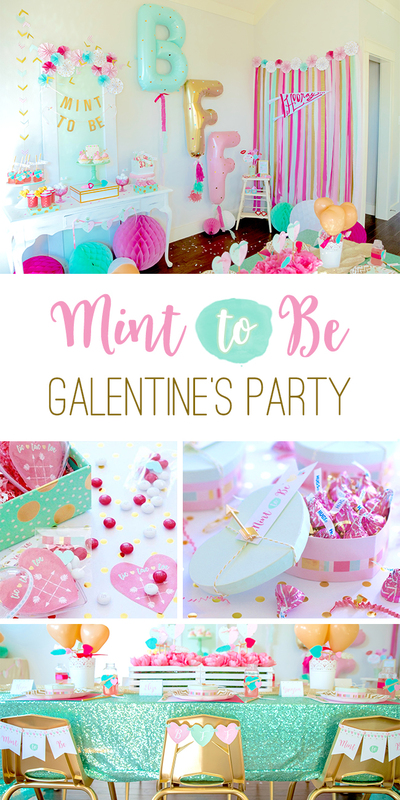 Keeping with the "Mint to Be" theme, mint was the color of choice for this Galentine's Day Party...with just the perfect amount of pink to complement it. 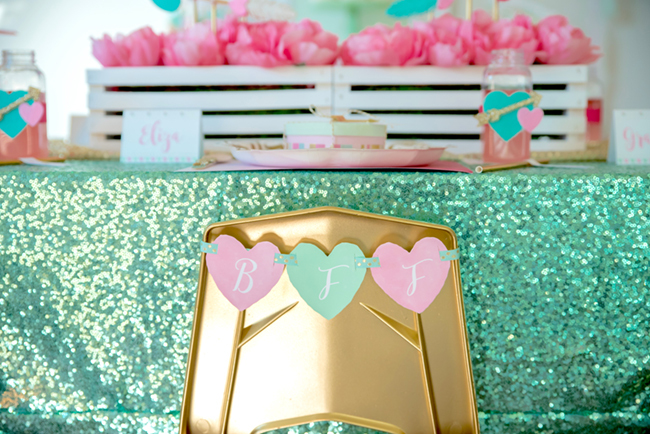 The mint sequin table covering was a scene stealer for sure, and showcased the place settings perfectly! Beautiful chevron plates from Oriental Trading adorned each place setting, along with scalloped ombre napkins, embellished flatware, raspberry lemonade in fancied up milk bottles, gold straws with our "xoxo" straw flags, and adorable little heart boxes with golden arrows and our "Mint to Be" favor tags. One thing you can always count on in Annaliese's parties, other than the fact it will be adorable, is that the chairs will be decked out! 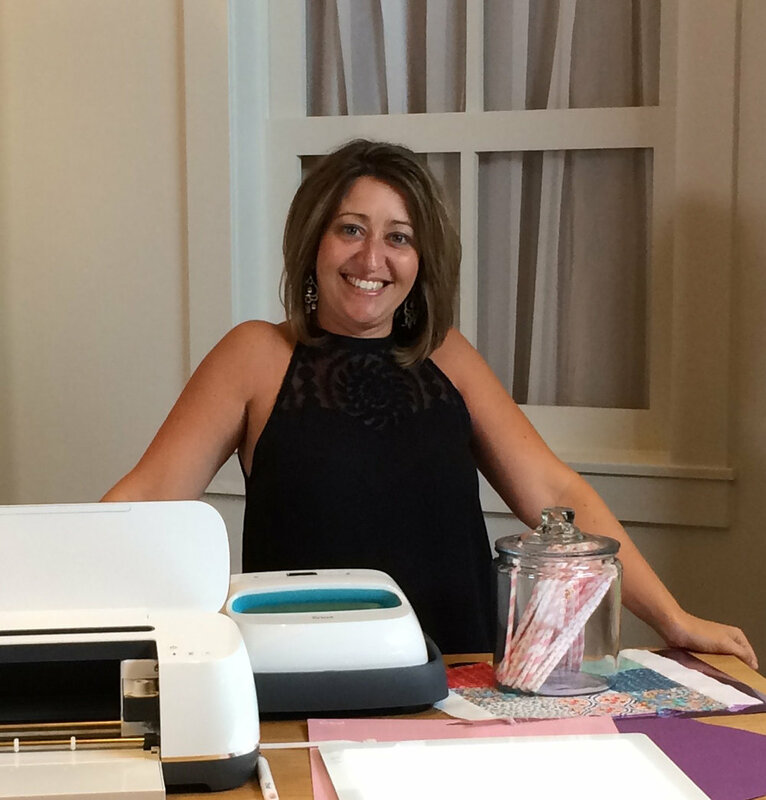 It's a fun little detail that is often overlooked when decorating, but this girl nails it every time! I designed two fun banners for the backs of the chairs and I just love the way she used them! Aren't they the cutest?!! Find the banners in the shop here. The centerpieces consisted of mini heart balloons clustered in vases, along with boxes filled with peonies, hearts, and arrows. The enormous BFF balloons were definitely the stars of the show as far as decor goes. I mean just look at those babies! Annaliese spray painted them to match the theme colors, then jazzed them up with gold hearts and festive tassels. Aren't they amazing?!! A celebration of gals just wouldn't be complete without something to satisfy the sweet tooth, and Annaliese did not disappoint! The sweets table was anchored by an antique door that was decorated with festive paper pinwheels and garlands. White chocolate cupcakes with strawberry frosting, strawberry cookies, strawberry shortcake custard, donut holes, and bags of strawberry and vanilla popcorn were all available for the girls to indulge in. Aren't those cookies just gorgeous?!! They were hand painted by the oh-so talented Mel of Say Anything Bakery. Our "xoxo" straw flags and "Mint to Be" favor tags made another appearance here, as well. Of course, the littles couldn't go home empty handed, so fun little party favors were on hand. Little jars of conversation hearts, sassy confetti poppers, and our printable heart tic-tac-toe games with M&M playing pieces were a few of the goodies that the girls got to take home, but not before a quick stop at the super cute photo booth. There's just no way that this adorable Galentine's Day Party could end without some fun selfies, right?!! Big thanks to Annaliese for inviting me to be a part of this girly gala. I hope you enjoyed it as much as we did!